Dog Lovers Around the World Agree: That’s One for Pope Francis. The new pontiff was presented to the world as: “Cardinalem Bergoglio, qui sibi nomen impost Franciscum.” (translated: Cardinal Bergoglio, who takes for himself the name of Francis). Bergoglio’s decision to become the first pope ever to be known by the name Francis is almost unprecedented and a bold choice, according to Vatican analyst John Thavis. Picked in a reference to Saint Francis of Assisi, the most iconic saint in Catholic tradition, the name symbolizes poverty, humility, simplicity and peace. “What has made this pope an early hit with the public is the sense that Francis is more than a name. It is a statement about the kind of pope he wants to be,” Thavis wrote on the National Catholic Reporter. 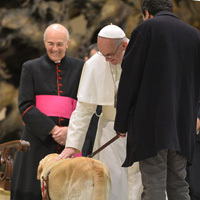 So, it is no coincidence that one of the first privileged to receive a physical blessing from Pope Francis’s hands this past weekend was a Labrador Retriever named Asia. Scores of journalists came from all over the world to cover the conclave that led to the election of the first Jesuit, the first non-European and the first Latin American pontiff. Asia is a service dog belonging to visually impaired radio journalist, Alessandro Forlani, who works for Italian RAI radio. As Forlani waited in line with Asia to enter the hall, security guards told him that most likely he would not be allowed inside. “But after a few minutes, Vatican officials gave me the green light, and I was accompanied by a Swiss guard to the audience hall,” said Forlani. He and Asia were seated near the first row of seats. At the end of the pope’s magnetic speech, a previously-selected group of media notables was presented to the pontiff. While the journalists lined up to be greeted by Pope Francis, Vatican officials approached Forlani and Asia. Pope Francis blesses Asia, a Labrador Retriever. Photo credit Discovery News. It was a fitting image for a pope inspired by the patron saint of animals. The New Barker dog magazine is Florida’s top dog lifestyle magazine. Author Anna CookePosted on March 21, 2013 Categories UncategorizedTags The New Barker, The New Barker dog magazine. Previous Previous post: The Power To Light Up A Room. Next Next post: Jacqueline Sheehan’s Book, Picture This, A Favorite Read of The New Barker.